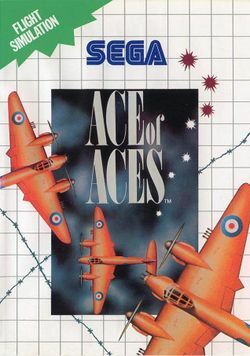 Ace of Aces is a flight simulator developed by Artech Digital Entertainment in 1986. It was published by several companies, however the game was put on two separate media. Accolade published the game on 5.25" disks for Atari consoles, whereas Atari put the game on cartridges for its consoles. The game takes place during World War II and the player flies a Royal Air Force de Havilland Mosquito long range fighter-bomber equipped with rockets, bombs and a cannon. Missions include destroying German fighter planes, bombers, V-1 flying bombs, U-boats, and trains. South American Sega Master System box. This page was last edited on 11 November 2009, at 23:40.